‘Gems’ in the attic: 3 VHS tapes about email projects in English teaching from 1994 – 1998. Romanians are wonderful people but as far as the authorities are concerned if there’s the most difficult solution to a simple problem you can be pretty sure they will apply it. Being in the European Union has given the bureaucrats another million reasons to make almost anything as difficult as possible. After a week of wrestling with this amazing bureaucracy, to the point where I was tempted to give up and go home early, along comes a young man who arrives when he says he will, does the job quickly and efficiently and the cost at the end, very reasonable, was at the bottom of his estimate range rather than the top. Details at the end of this post. It began with a search for two books in the attic of my parents-in-law, where some 14 years ago I had stored a lot of ‘stuff’ and hardly approached it since. The books: proceedings of a conference in, if I remember correctly, USA and Mexico simultaneously, on using internet in English teaching, at which I presented a paper from Romania, Bucharest, at around midnight – very unusual in the mid 1990s; the other book was about English idioms, by George Stan, head of English at Liceul National in Iași where I was teaching at the time – a great guy who gave me a really generous acknowledgement in the book for my editing of it. Sadly, neither book was there. Most of the ‘stuff’ was now junk but I was excited to find three ‘gems’ – three VHS tapes, one labelled ‘An English Nativity Play’, another ‘Școala nr.1 (School no.1) Suceava/email project’, the third was a recording of a show celebrating 8th March (1998) at a different school. Petronela’s parents have a working VHS player and with some trepidation I put in the first of the tapes and pushed ‘play’. 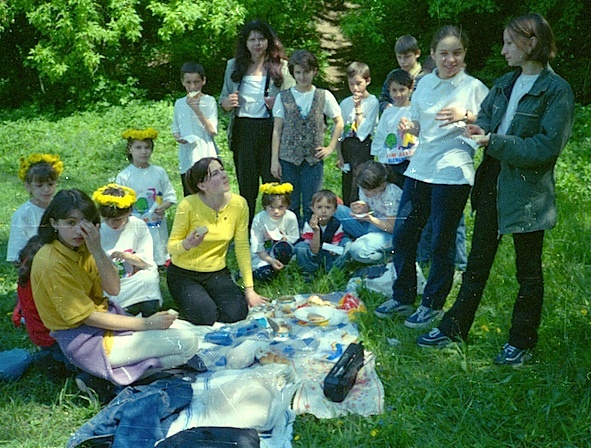 I was taken back to Christmas 1994 and the nativity play was as I hoped, that performed by my students at School No.1 in Burdujeni, Suceava; it was also broadcast by a local tv station on Christmas Day itself. The angel who brought the good news to the shepherds I met about a week ago though she is now a lawyer in Baia Mare – Anca, who I wrote about in my previous post. Other former students who I hope to meet over the next 2 or 3 weeks also feature in the play. The second tape was a presentation of some of the email projects (my conference paper was about these) done by the same group of students, who eventually named themselves the ‘Allstars’. The presentation was to an American couple who delivered ‘obsolete’ IBM laptops to Romanian schools. I used one, eventually two, in email projects as part of my English teaching, linking up with, eg, schools in Vancouver and Northumbria, UK – no Windows, but using MsDos. The third tape, the recording of an 8th March Show, I will not try to insert here as it is almost 1 hour long and only a small part towards the end is a performance for which I was responsible. This performance is by a special needs class in School No. 11 which became ‘The bunnies’ and incorporated the song ‘Heads, shoulders, knees and toes’. They did their own email project with a special needs class in the USA and were ‘adopted’ by the Leo Club formed by some of the students at School No.1. When I get back to UK and on my Mac I should be able to extract the relevant part and do a post about that. I’ve been able to post the recordings on Youtube, and so hopefully within this post (I’ve never attempted such a thing before – it seems to be working). I cannot cut out the ‘rubbish’ at the start of each till, again, I get onto the Mac at home but after a few seconds the actual film should appear. I’ve been able to do this only due to the great service from one Romanian young man. Following a phone call he collected the VHS tapes Monday lunchtime, transferred to DVDs and delivered them early Tuesday. The cost? About 1/25th of the cost of transferring the one tape of our wedding (also VHS) to DVD in the UK.